The Pacific Northwest is one of the most extraordinary regions of the United States ... A region shaped by volcanism ... A land rich in history of American Indians, explorers and pioneers ... An agricultural paradise. The Pacific Northwest has an economy that combines the proven industries of the past with the glorious technologies of the future. But it is also a leader in green technology a region striving to reduce its carbon footprint and adapting to climate change ... This series presents leading state and regional experts on the geography and climate change of the region. The series three programs are Geography, History and Climate Change. 1.) Landforms of the Pacific Northwest. 00:13:04The Cascade Range, Mount Rainier, Mount Saint Helens, tectonic forces, subduction, glaciers, Puget Willamette Trough, Strait of Juan de Fuca, fjord, Willamette Valley, Columbia Plateau, Columbia Basin, Great Basin, Palouse Plateau, Rocky Mountains, hotspot, Snake River Basin, Salmon River, and the Yakima River are covered in this chapter. 00:10:54The Pacific Northwest has a temperate rain forest as well as tide pool ecosystems, prairie ecosystems, brush steppes, northern pine forest, and has remarkable life forms such as killer whales. 00:02:59Oregon human geography is shown. 00:04:01Washington human geography is shown. 00:03:14Idaho human geography is shown. Students study Pacific Northwest History. 00:05:29The Pacific Northwest's history is a rich legacy of prehistory Paleo Indians found in places such as Paisley Caves and including, Kennewick Man, and later Northwest Indians such as the Nez Perce and Yakima. 00:03:20Exploration of the Pacific Northwest began with brave explorers like Sir Francis Drake and continued with the Corps of Discovery expedition led by Lewis and Clark, which wintered in Oregon at, Fort Clatsop, and the British Hudson Bay Company's Fort Vancouver. 00:03:16The Oregon Trail, brought people to the Pacific Northwest where they went south into the Willamette Valley, and north to Puget Sound where they were welcomed by Chief Sealth, also known as Chief Seattle. 00:02:55The Indian Wars included fights with the Bannock, Shoshoni, and the Nez Perce, led by Chief Joseph. 00:02:17Oregon Settlers came first to the Willamette Valley, and from here, the Oregon Treaty of 1846 gave the region to the U.S. and it would become the states of Oregon, Washington and Idaho. 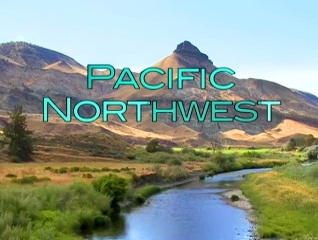 00:03:40The Pacific Northwest boomtowns, were a result of Pacific Northwest mining and Pacific Northwest lumber. 00:03:01Seattle and Tacoma were the Pacific Northwest's biggest seaports and home to the International Workers of the World, also known as the Wobblies. 00:02:26The New Deal brought in the Owyhee Dam and the Columbia River's Bonneville Dam to provide hydroelectricity through the BPA, the Bonneville Power Administration. 00:04:01Portland and Seattle are known for their businesses such as Bill Gates' Microsoft, Boeing Company, Amazon Books, Starbucks Coffee, and Nike. Students study Pacific Northwest, climate and global warming. 00:07:06The burning of fossil fuels causes global warming, or climate change, which affect the region's ecosystems. 00:05:39With global warming, Forest ecosystems, such as in the Cascade Mountains, are devastated by fire ecology, pine beetles and bark beetles. 00:09:04Glaciers, like the Cascade glaciers, are decreasing with less snow pack, lessening the fresh water supply of rivers like the Salmon River. 00:06:56Climate change Impacts will be greatly felt in the agricultural areas like Magic Valley, Yakima River Valley and the Palouse Plateau, where irrigation is what allows crops to grow.